The Wescott House was designed by Frank LLoyd Wright in 1906, and was then built in 1908 for Mr. Burton J. Westcott and wife Orpha. 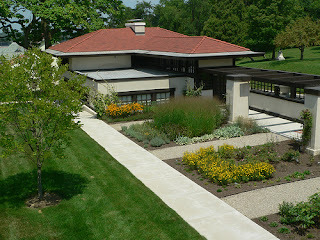 It is located in Springfield, Ohio, and is the only house that Wright ever designed in Ohio. 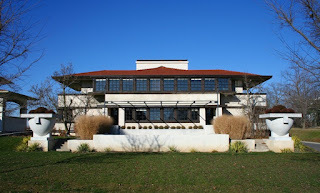 The house is a Prairie Style house, which according to Wikipedia is "usually marked by horizontal lines, flat or hipped roofs with broad overhanging eaves, windows grouped in horizontal bands, integration with the landscape, solid construction, craftsmanship, and discipline in the use of ornament. Horizontal lines were thought to evoke and relate to the native prairie landscape." The Wescott House's official website describes how the design "extended Wright's concept of relating the building to its site by means of a terrace, a lily pond, gardens, and other landscape elements." The house is open to public to visit and tour, as well as to rent out for a gathering or event. The Wescott House Foundation holds lectures, events, workshops, educational programs for both students/youth and adults, and features exhibits. Their website also states, "Westcott Center For Architecture + Design is an official PKN organizer in Springfield, Ohio."